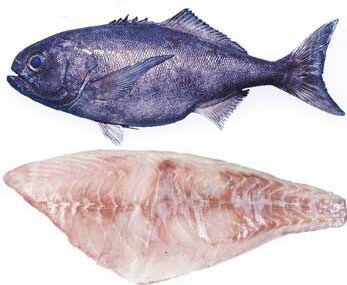 The Blue-eye Trevalla is a benthic species that is found on rocky seabeds in continental slope depths. Juveniles tend to be around the midwater to surface level. Blue eye mainly feed on the tunicate Pyrosoma atlantica. However they will feed on a range of fish, molluscs, squid and crustaceans, they are also cannibalistic. Spawning appears to occur in an area north east of Tasmania during March and April. Little is known about the egg and larval stages of blue eye. Recently Antarctic butterfish of approximately 10 cm have been found living in association with large masses of floating kelp. It is believed that as these juveniles reach 50 cm they become semi-bottom dwelling. These young fish form schools over hard bottom at depths of around 350–450 m, moving to deeper waters as they grow. It occurs circum-globally in southern temperate marine waters. Unlike many other methods of fishing, this method depends on the fish seeking out prey and not just moving or forming schools. One of the most common hook fishing methods used in Victoria is longlining. The basic method is to set out a long length of fishing line, often several kilometres long, to which short lengths of line carrying baited hooks are attached. The longlines are hauled up periodically. The gear is often set on the bottom where it is held by anchors. The start and finish of the long-line is marked with buoys and flags. Longlining is used to catch snapper, school shark and gummy shark. A longline set below the surface is used where the target species is pelagic. The line is suspended at the required depth by using regularly spaced buoys along the longline. This method is catching tuna off the eastern Victorian coast. A variation of hook fishing is droplining in which a longline is suspended vertically. This method is used in the blue-eye trevalla fishery. Taste, Texture Mild, pleasant taste. Large flakes, firm to medium texture.